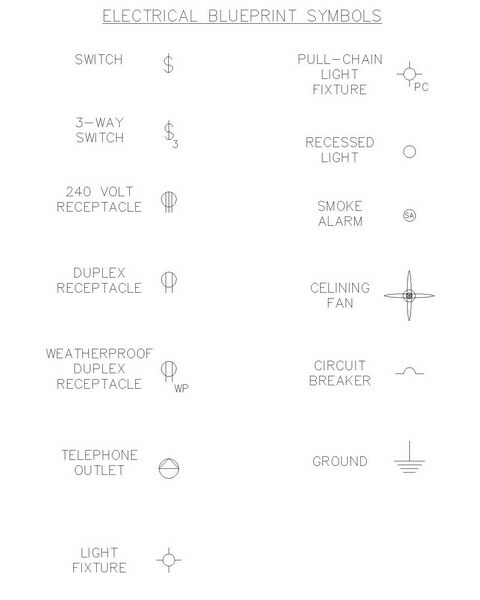 "An Electrical Drawing Symbol Library Explained." AutoCAD electrical symbols are pictorial signs used to depict the location of various electric elements (such as wall receptacles / plugs, light switches, ceiling fans, panels and light fixtures) that can be seen on blueprint drawings. Engineers and architects often create special electrical drawings that bring these electronic symbols into the foreground, so they stand out. They may also use electrical drawing software program that specifically creates electrical drawing symbol blocks. All the while displaying the basic architecture of the building or home in the background. Bear in mind that these electrical drawing symbol graphics can mean one thing in one country, and be understood differently in another country. With that said, the following is a list of symbols commonly used in the electrical field in the United States and Canada. Go to the end of this page to access a .pdf file that can be saved to your computer and printed out for off line use. Open a free electronic symbol file here, to print.